Indigenous Protected Areas allow traditional owners manage the land and pass on knowledge. And they can work really well. An Indigenous Protected Area (IPA) is an area of Aboriginal-owned land or sea where traditional owners have entered into an agreement with the Australian government to promote cultural resource conservation and biodiversity. When Aboriginal landowners decide to declare their lands an Indigenous Protected Area, they agree to manage their country for conservation and to meet international conservation standards. What are Indigenous Protected Area good for? IPAs provide Aboriginal people with an opportunity to look after their country in their own way and pass on their knowledge about the land and its resources to future generations . IPAs also create jobs and qualifications, economic and social benefits for Aboriginal communities, and protect the environment. Through Indigenous Protected Areas, Aboriginal communities manage their land to protect its plants, animals and cultural sites. Day-to-day management includes weed and feral animal control, fire management, revegetation, wildlife protection and monitoring. The analysis report noted that IPAs and ranger programmes were "effectively overcoming barriers to addressing Indigenous disadvantage and engaging Indigenous Australians on country in meaningful employment to achieve large-scale conservation outcomes". Lying at the edge of the Great Victoria Desert on the southern margin of Australia's majestic Nullarbor Plain, Yalata Indigenous Protected Area (IPA) covers 456,300 hectares of coastal dunes, limestone cliffs, sand plains and shrublands. It was declared in October 1999. How many Indigenous Protected Areas exist in Australia? Since IPAs were first championed in the early 1990s. In 1998 South Australia declared the first Indigenous Protected Area - Nantawarrina, about 555 kms north of Adelaide. There are now 60 declared Indigenous Protected Areas covering just over 48 million hectares across Australia. Indigenous Protected Areas now cover an area which equates to around 36% of Australia's network of protected areas . Australia's IPAs range from the turquoise waters of the Dhimurru IPA in the Gulf of Carpentaria to the arid beauty of Australia's first IPA at Nantawarrina in South Australia. The largest declared Indigenous Protected Area is the Southern Tanami in the Northern Territory, at 10.16 million hectares and the smallest is Pulu Islet in the Torres Strait, at around 15 hectares . 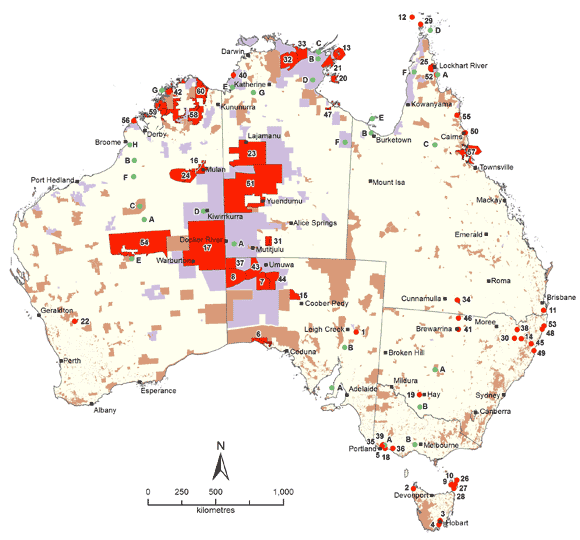 Map of Australia's Indigenous Protected Areas as of August 2013 . IPAs are marked in red, other protected areas are brown, and Aboriginal lands are purple. "This country was almost gone." For decades Aboriginal elder Lofty Bardayal Nadjamerrek, 83, saw the rock country of Arnhem Land in the Northern Territory as an orphan with no-one to care for it. All the region's clan families had moved into the mission towns, abandoning the land where their ancestors existed for over 50,000 years . Regular traditional burning stopped and huge late-season bushfires—some raged for months and had 200 to 300 kilometre fronts—permanently damaged the landscape. In 2002 Mr Bardayal led a movement of his people back to the plateau, establishing a base in bushland 550 kilometres east of Darwin from where they again began to take care of the land. In September 2009 two new Indigenous Protected Areas were established in that area covering an area about one-third the size of Tasmania. "This country was almost gone. If we had not come back it would have been lost forever," said Mr Bardayal. The stories of Australia's first 23 Indigenous Protected Areas are told in the book Growing Up Strong - The First 10 Years of Indigenous Protected Areas in Australia.